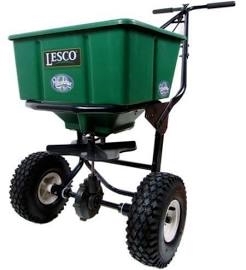 Lesco Walk Behind Spreader with a 50 lb. hopper capacity and enclosed gearbox to protect gear system from dust and debris. Features 50 lb. hopper capacity. Powder-coated carbon steel frame. Same operation as the popular Lesco 80 lb Spreader. The spreader cover minimizes any fertilizer dust getting out and moisture getting in. For working in a residential setting, it also demonstrates a greater degree of care for their environment.